WARSAW | Thousands of youth from Israel, the United States and other countries marched Thursday between Auschwitz and Birkenau, the two parts of Nazi Germany’s most notorious death complex, to honor the millions killed in the Holocaust. Also Thursday, Polish officials and members of the Jewish community gathered in Warsaw to mark the 69th anniversary of the start of the Warsaw Ghetto Uprising, the doomed revolt that a group of Jews waged against the Nazis in 1943. 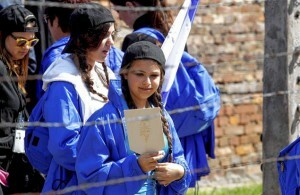 An estimated 10,000 young people, some carrying Israeli flags or wearing them draped around their shoulders, took part in the March of the Living in Oswiecim, a town in southern Poland where the Germans operated Auschwitz during World War II. The event, which takes place every year on Holocaust Remembrance Day, involves a walk of two miles from Auschwitz to Birkenau, where Hitler’s men executed Jews, Roma and others in huge numbers in gas chambers. The participants were joined by a handful of Holocaust survivors and American military veterans who helped liberate several other death camps at the end of World War II. Auschwitz-Birkenau was liberated by Soviet troops in January 1945, in the closing months of the war as Germany faced defeat. TOKYO | A Tokyo developer took visitors up the world’s tallest freestanding broadcast structure on Tuesday, April 17, a 634-meter (2,080-foot) tower with special technology meant to withstand earthquakes that often strike Japan. The needle-like radio and television tower opens to the public on May 22. Journalists given a tour Tuesday saw sweeping if hazy views of the Tokyo skyline. It took about 50 seconds in a high-speed elevator Tuesday to zip up to the lower observation deck at 1,148 feet, and another 30 seconds to reach the higher deck at 1,476 feet. 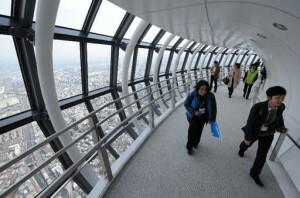 The Skytree has a restaurant and two cafes on the observation decks, a vertigo-inducing glass floor that allows visitors to look straight down, and an emergency staircase with 2,523 steps. The tower was constructed with extremely strong steel tubes surrounding a central concrete column that are structurally separate from each other in the tower’s mid-section. In the event of an earthquake, the concrete core and steel frame are designed to offset each other to reduce the building’s overall motion. The Skytree has been built to stand firm even if a magnitude 7 quake were to strike beneath the building, said Sho Toyoshima, a spokesman for Tobu Tower. He said the tower sustained no structural damage from the magnitude 9.0 quake that struck off Japan’s northeastern coast last March, even as it was being built. The Skytree is expected to bolster television and radio transmissions in the capital region. Owners hope it will also become a new tourist destination in Tokyo. On Sat., April 21, a group of women arrive in a bus before a meeting between men and women at the village of Candeleda, central Spain. CANDELEDA | Inspired by a Hollywood western, a Spanish dating association is trying to slow a population drain from the country’s beleaguered central villages, introducing bachelors to women bussed in from the big city of Madrid with hopes of ending a bride shortage. Candeleda, a town of 6,000 on the banks of the picturesque Lobera River, hosted a weekend fiesta to welcome 68 women for a meet-and-greet with the village’s single men. Ancient cave paintings show Candeleda has been inhabited for some 5,000 years, and resident Jose Miguel, 67, said he would hate to see its population dwindle after such a long history. The group, Asocamu, was set up in 1995 to promote rural re-population by organizing parties for single men and woman, but Spain’s painful financial crisis and the lure of city jobs has made the need more pressing than ever, Manuel Gozalo, one of the organizers, said Sunday. Many villages are falling into ruin, with national statistics showing that of Spain’s 5,000 villages up to 100 are under imminent threat of abandonment. Large swathes of central and northern Spain are at risk of depopulation. In the small agricultural communities of Spain’s central plain single, male residents were finding the loneliness too tough to endure, Gozalo said. Asocamu credits as its inspiration the 1951 film “Westward the Women,” starring Robert Taylor and Denise Darcel, which tells the story of how the American west was populated by organizing wagon trains of women to provide company, and brides, for lonely pioneers. Blanca Fernandez, 52, works in sales in Madrid and was attracted by the idea of a nice day out and a chance for romance. “I know it’s difficult to find the love of one’s life, but some of these meetings have led to marriages,” she said. b) Read about the Holocaust under “Background” below the questions. Then, visit several of the websites linked to under “Resources.” List at least 3 facts that you learned about the Holocaust that you did not previously know. c) Why should all students worldwide learn about the horrific events of the Holocaust? b) How many feet taller is the Skytree than either of the Twin Towers were in NYC? c) What magnitude earthquake has the Skytree been built to withstand? d) Watch the video and check out the link to the world’s tallest building the Burj Khalifa in Dubai. Do you think you would enjoy visiting these buildings? Explain your answer. b) When and why was Asocamu established? c) Do you think having these meet and greets is a good way to increase the population in these villages? Explain your answer. Yom HaShoah (in Hebrew) – “Remembrance Day for the Holocaust and Heroism” (known in English as Holocaust Remembrance Day), is observed as a day of commemoration for the approximately six million Jews who perished in the Holocaust. In Israel, it is a national memorial day. Yad Vashem (“Holocaust Martyrs’ and Heroes’ Remembrance Authority”) is Israel’s official memorial to the Jewish victims of the Holocaust established in 1953. The origin of the name is from a Biblical verse: “And to them will I give in my house and within my walls a memorial and a name (Yad Vashem) that shall not be cut off.” (Isaiah 56:5). Auschwitz (1940–1945), was a network of Nazi concentration and extermination camps built and operated by the Nazis in Poland during World War II. It was the largest of the German concentration camps, consisting of Auschwitz I (the base camp); Auschwitz II–Birkenau (the extermination camp); Auschwitz III–Monowitz, also known as Buna–Monowitz (a labor camp); and 45 satellite camps. From early 1942 until late 1944, transport trains delivered Jews to the camp’s gas chambers from all over Nazi-occupied Europe. The camp’s first commandant, Rudolf Höss, testified after the war at the Nuremberg Trials that up to three million people had died there (2.5 million gassed, and 500,000 from disease and starvation),a figure since revised to 1.1 million, around 90 percent of them Jews. Others deported to Auschwitz included 150,000 Poles, 23,000 Roma and Sinti, 15,000 Soviet prisoners of war, some 400 Jehovah’s Witnesses and tens of thousands of people of diverse nationalities. Those not killed in the gas chambers died of starvation, forced labor, infectious disease, individual executions, and medical experiments. Watch videos posted at youtube from Yad Vashem. and Yad Vashem’s youtube page at youtube.com/user/YadVashem. Visit the website for the Auschwitz-Birkenau Memorial and Museum at: en.auschwitz.org.pl/m.